Wing Loong I-D, China's domestically-developed Wing Loong UAS family's new member that debuted at the just concluded Airshow China, uses complete composite materials for its fuselage and is sure to have better performances, says its chief designer Li Yidong. An echelon of J-20 fighters perform at the 12th China International Aviation and Aerospace Exhibition (Airshow China) in Zhuhai, south China's Guangdong Province, Nov. 11, 2018. The air show closed on Sunday. An echelon of J-20 fighters are seen at the 12th China International Aviation and Aerospace Exhibition (Airshow China) in Zhuhai, south China's Guangdong Province, Nov. 11, 2018, commemorating the 69th anniversary of the People's Liberation Army Air Force. Deals worth more than $21.2 billion have been signed at the 12th China International Aviation and Aerospace Exhibition (Airshow China). Russian arms exhibitors in Airshow China 2018 said China is developing so fast in aerospace and aviation that cooperation modes must be updated to meet the pace of potential demand. China's Hongying (Red Eagle) Aerobatic Team perform at the 12th China International Aviation and Aerospace Exhibition (Airshow China) in Zhuhai, south China's Guangdong Province, on Nov. 7, 2018. Photo taken on Nov. 7, 2018 shows armored vehicles after a dynamic display of ground military equipments at the 12th China International Aviation and Aerospace Exhibition (Airshow China) in Zhuhai, south China's Guangdong Province. China's Bayi Aerobatic Team perform at the 12th China International Aviation and Aerospace Exhibition (Airshow China) in Zhuhai, south China's Guangdong Province, on Nov. 6, 2018. The air show opend on Tuesday. 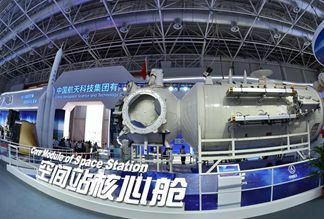 A full-size model of the core module of China's space station Tianhe made its debut at Airshow China, which opened Tuesday in Zhuhai. Opening Tuesday in Zhuhai, the airshow runs until Nov. 11 and is attended by over 700 exhibitors from 40 countries and regions. President Xi Jinping said on Tuesday that China remains committed to promoting development in aviation and aerospace technologies with other countries, allowing people around the world to share the benefits of such progress.